Nothing too interesting to report here. Lots of meetings, planning, and strategizing for the rest of 2015/early 2016. It’s going to be a busy few months! Even though I enjoy my job, I must say, having cool coworkers makes it that much better. They all share my love for good food and adventure. There are always amazing restaurants and fun things to do on the agenda when we get together (re: Play below). I’ve been eating Pret A Manger’s porridge for breakfast every day. You guys, it’s so so so good! I’ve blogged about it before, but for those who missed it, this stuff is creamy, hearty, and delicious. And the berry compote takes it to the next level. Tart, slightly sweet, and mmm mmm good! The combination is out of this world! 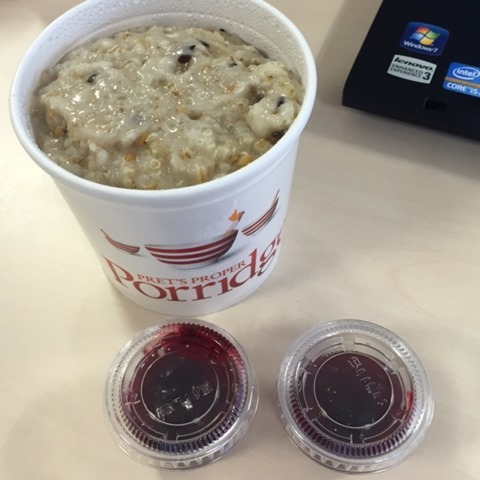 Dear Pret, never ever stop selling porridge! Remember when my boss and I were in NYC for a conference and we ate at Kati Roll three times in one week? 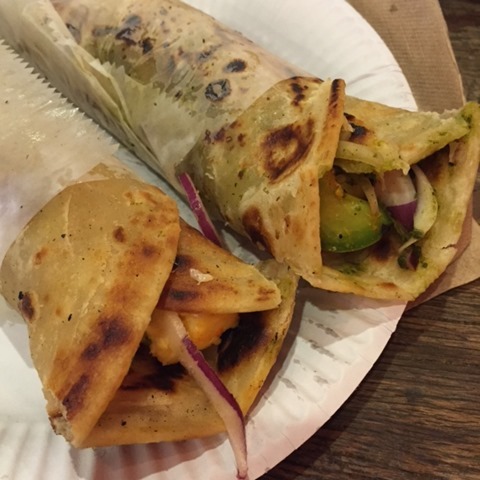 Well, guess what…there’s a Kati Roll in London, and we went for lunch on Monday. Luckily, it was just as good as we remembered it! While the two restaurants listed above are not new to me, we did check out an entirely new place called Inspiral. The menu is really unique in terms of it’s offerings. As in, it’s vegan/vegetarian/raw. We tried the raw nachos made with flax and cashews, a veggie burger that came with the most delicious vegan mayo, and the raw lasagna with zucchini noodles as the base. And of course, you can’t leave without trying some rich chocolate/avocado/coconut butter fudge cake (that went unpictured). So unexpectedly yum! Last time I came to London for similar meetings, my coworkers planned a lot in terms of sightseeing. This time around, because I’ve seen most everything, we decided to lay low and do something different. 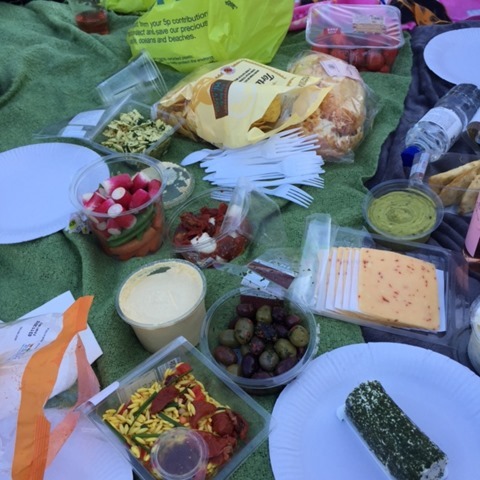 So we went to Regent’s Park and had a picnic! 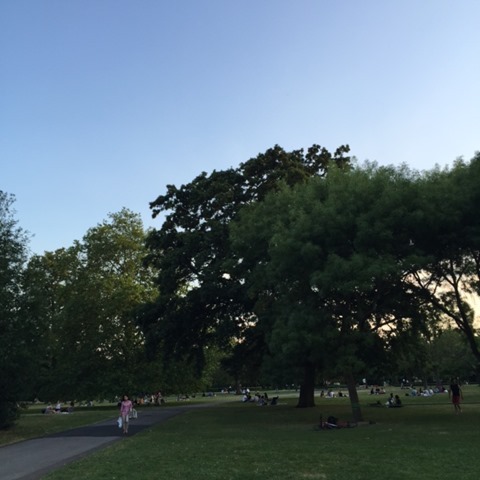 Delicious food, great weather, and my goofy colleagues – the perfect combo for a fun evening in the park! Lots of other people had the same idea! So glad you’ve had a great time here, P! I need to try the porridge at Pret when the weather cools down- do you get it with soy milk or water? Adding Inspiral to my list – looks just up my alley! Happy 3 years to you & Vishnu! Cheers to many more joyous years together! So the porridge is pre made and I have no idea what it is made with! 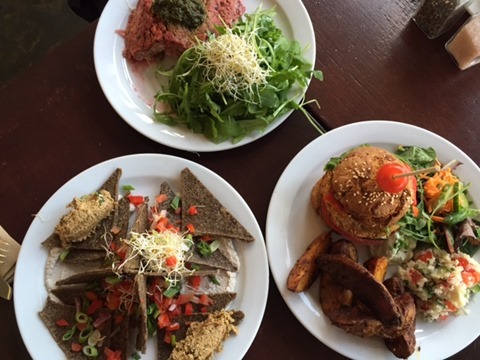 It’s delicious though 🙂 And you need to check out Inspiral – it has a really cool vibe and all the food we ordered was tasty! Do they have that porridge at the U.S. locations? I’m guessing no. It sounds fabulous though! It sounds like it’s been a great trip! And happy anniversary!! Unfortunately, there is no porridge at the US locations! I did a lot of research on this. Ha! The closest thing we have is oatmeal. I’m definitely getting hungry reading about Kati Rolls!! Never really had porridge before… but I’m guessing its pretty much like oatmeal… which I love! It’s like oatmeal in some regards but much creamier! Everyone in my office thought I was nuts for eating it every day but it’s just that good!